I've always avoided BattleTech the board game. Quite frankly it has always intimidated me, because of all the charts it had, and how complex the rules seemed to be at a glance. It still is really quite complex, but with some effort it can be learned and enjoyed like any other tabletop game. Even the newest books are tomes in size, and there's an entire book dedicated just to building your own units for the game, which weighs in at 352 pages itself. Intimidating stuff indeed, but that is only if you allow it to intimidate you! I decided it was time take the plunge, and to dig in and see what true BattleTech is all about. 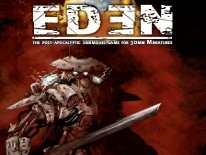 BattleTech is also the most documented and in-depth sci-fi universe in all of tabletop gaming-dom, with only maybe Warhammer 40k pulling ahead of it by a nose. There's more books and fictional stories set within the BattleTech universe than I can even begin to count. There's an entire online subscription-based website called BattleCorps, which has published over 1 million words already, and that's not counting all of the books released at retail over the past 25 years. In the realm of electronic gaming, BattleTech is, and always has been a juggernaut too. It's been around for 25 years now, so there's literally 25 years worth of BattleTech data out there to dig into. It can also be a little confusing figuring out just where to start outside of the Introductory Boxed Set. It just so happens that the last Introductory Boxed Set is out of production at the moment, because an all new Introductory Boxed Set is in the works to coincide with the 25th Anniversary of BattleTech. Therefore I picked a unique time, to say the least, to dig into BattleTech for the first time. There's so many books available in the way of rulebooks and expansions, that a guy walking into a store that stocks most of them will be lost in a heartbeat, especially if all they want to know is what do they need to get started with. There's a few different games available through Catalyst Game Labs which are set within the BattleTech universe too. There's the Total Warfare-based game, which is the core BT board game, and Total Warfare is the core rulebook for the board game version of BattleTech period. There's an RPG game to allow you do jump into roleplaying in the BattleTech universe called A Time of War. If you're looking for a sci-fi D&D-like game of BattleTech, A Time of War was just released, and is the most updated version of the BattleTech RPG gaming system. The Tactical Operations book is considered the Advanced Planetary Conquest Rulebook for BattleTech gaming, and adds a ton of new optional rules (from movement to combat, artillery, new advanced units and so on), as well as Advanced/Experimental Rules weapons and equipment. This book is totally optional, and it is used an an expansion of the rules for Total Warfare's system. Strategic Operations is considered the Advanced Solar System Conquest rulebook which still adds more complexity and rules to the Total Warfare rules for BattleTech gaming. However the 2nd part of this book also introduces the larger scale rules of BattleForce. In a nutshell, BattleForce condenses the Record Sheets from TW BattleTech down into smaller cards with less stats, to make playing a larger scale battle easier and a little quicker. This book is also optional. The only book considered a companion of Total Warfare core rulebook is the Tech Manual, and even it is optional, because it's a massive tome for creating your own units of any kind for BattleTech, along with loads of fluff and all of the weapon stats and information. It's a good read, but it's optional, that is unless you want to start creating your own units from the start. Back in the earlier years of BattleTech there was so many expansions to consider, and back then the BattleTech core rulebooks covered just BattleMech combat. Everything else was spread out into little bits and pieces via expansion books. In the golden age of BattleTech if you wanted to play with AeroTech stuff you had to buy the AeroTech expansion, or if you want to dive into urban combat there was CityTech and so on. Today Catalyst Game Labs have taken all of the core information that was once spread out through multiple products and put the basic rules all together into the single Total Warfare Core Rulebook. Total Warfare covers the basic rules for Mech on Mech combat, but it also gives you the rules for vehicles, infantry, protomechs and even AeroTech fighters (now called Aerospace) for planetary and space combat even. Therefore outside of the Introductory Boxed Set, Total Warfare is the single rulebook needed to play BattleTech the board game. Total Warfare expands upon what they give you in the Introductory boxed set too, and is the next step up into the BattleTech universe for the Intro-Boxed-Set gamers. The free Quick Start Rules are much less complex than the rules found in Total Warfare too, because the Quick Start Rules is a dumbed down more simplified version of what Total Warfare has to offer. So if you want to play the game the way it was meant to be played, it's a little harder road to travel, but in the end I think it's a much more rewarding experience playing with the Total Warfare rules. The Total Warfare core rulebook is 312 pages long. It comes in a really nice hardcover, or as a .PDF. For this review I've been using the hardcover Catalyst was kind enough to provide. It's a very high quality production too, as the pages are all rather thick, printed on premium glossy paper in full color, and the cover is quite thick as well. It's not flimsy or thin as some hardcovers tend to be in this day and age. Essentially this is a true hardcover book in every way. The book kicks off with a 13 page introduction. This brief section even covers what companies out there create officially licensed BattleTech products. It's a nice primer. A short story follows, detailing the various houses, with a map showing which regions are controlled by which houses and what not. Next up pages 20-26 define what a Unit is, and in this universe the BattleMech might be the most easily recognized unit, but there's a lot more different units in this game than I ever imagined. This section is very helpful for a new player, and even someone like myself who knew of many of these units, but even I learned about a variety of others I never knew existed before reading Total Warfare. Pages 26.5-30 covers the Record Sheets in great detail. This section covers every type of Record Sheet too, not just the Mech sheets. There's infantry, vehicle, ProtoMech, Battle Armor, Aerospace and Mech sheets covered in-depth within this section. You'll also find a really nice sidebar to the right of most pages, which offers little tabs detailing which section of the book you happen to be reading. This makes navigating this tome a lot easier than most books without such a sidebar guide. Actually the Components chapter encompasses Units, Record Sheets and Mapsheets. So the next few pages cover how to use the hex-mapsheets which BattleTech the board game is played out upon in great detail. And so far everything is laid out in a logical order, as I didn't find I had to jump around much at this point. The next chapter is called Playing the Game, and it can be found at pages 36-43. This section is a primer for playing the game. It goes through what defines a round of play via the Sequence of Play section. There's an Initiative Phase, Movement Phase (Ground goes first, and then Aerospace units if any), Weapons Attack Phase, Physical Attack Phase, Heat Phase, and then the End Phase ends a single round of play. Now this section doesn't go into great detail as to how each phase works, and now is where you begin to jump around to learn how to conduct each of these phases. Page 44 offers another short story, this time by author Phaedra M. Weldon, and it's a Clan Wolf story. The next chapter covers Aerospace Movement, and begins at page 74 and runs through page 93. Now since I have no interest in playing any those models just yet, I simply glanced over this section quickly, and most gamers looking to learn the basics of Mech on Mech combat could do the same. Yet another short story separates the chapters again, this time a tale of the Draconis Combine by Steven Mohan, JR. Page 98 resumes with the chapter called Combat. The sub-sections include Attack Declaration, Line of Sight, Weapon Attacks, Firing Arcs, Firing Weapons, Critical Damage, Destroying a Unit, Other Combat Weapons and Equipment, Physical Attacks, Punch Attacks, Club Attacks, Physical Weapon Attacks, Push/Kick/Charge Attacks, Death From Above Attacks, Different Levels, Physical Attacks by Prone Mech and Unit Displacement. And this is the section where I was literally overloaded with information! This section begins at page 98 and ends on page 152, and there's a lot of ground covered in great detail, with many really nice examples, complete with in-depth photos and diagrams. However it's so much information all at once, that I had a really hard time figuring out just what I need to get started, and separating that from what is stuff I probably won't need to worry about until I have the basics down. Once I was able to figure out what's vital info,and what I can overlook for now, it becomes clear that they did a fantastic job of providing enough visual aides through examples to help get across what might not be so clear in words. So don't get me wrong, the Total Warfare Core Rulebook does a fantastic job of teaching the game, the only confusing part is being dropped into the middle of a section as big as Combat, plus being new to the game, and then not knowing where to actually begin. Another short story separates the chapters and on page 158-161 is the chapter called Heat, which dives into Heat management. Moving and shooting builds up heat in the units in the game, and can effect your units performance, and can even damage a unit going as far as causing explosions, and other detrimental effects. After yet another short story the Buildings chapter begins on page 166. Pages 166-179 covers Building Types, Movement Effects, Combat Effects, and Basements sub-sections, which goes over how buildings effect gameplay in BattleTech. I glanced over this section, because I didn't foresee myself getting into any large CityTech-like games just yet. I needed to learn how to walk before attempting to run. As you may have guessed by now, separating the chapters again is another short story, and on pages 184-187 is the chapter on ProtoMechs (bigger than infantry, but smaller than a BattleMech). Then after another short story the Combat Vehicles chapter is found taking up pages 192-199. In the Combat Vehicles section they cover them all, with sub-sections for Ground, VTOL, Naval and WIGE units. WIGE stands for Wing In Ground Effect, and WIGE units are described as low flying airplane units, which are tougher than VTOLs, but more fragile than most Ground units. Next Pages 204-207 is the chapter on Support Vehicles (airships, tractor/trailers, how to damage them, how to dismount or mount them, etc). Now pages 212-229 dives in to the Infantry chapter. Again since I'm trying to learn the basics of Mech on Mech combat, I only glanced over this section. However even at a glance it's clear that they cover all there is to know about how to play infantry models in BattleTech within this section. Pages 234-251 is the Aerospace chapter, which covers both space and atmospheric combat, even collisions and ramming with aerospace units. Again, this is another chapter that most gamers trying to learn the game can ignore, unless they want to jump in from the start and attempt playing Aerospace units versus Mechs, and vice versa. I wouldn't recommend it, because that's twice the amount of rules you'd need to learn at once. My poor brain began to hurt as glanced over this section, because it seems like Aerospace is a whole other game within the game rules-wise. Now pages 256-274 make up the Creating Scenarios chapter, and the sub-sections included are Forced Withdrawal, Type of Scenarios, Selecting Mapsheets, Unit Generation and Clan Honor. All in all this is your general rules for creating a game of BattleTech, as it starts out with the very basics, complete with a table to roll a D6 on to see which scenario you play, and helps explain the various ways you can compose a force to play a game of BattleTech with. This is a required reading section for sure for all new players. Lastly pages 288-299 is the Painting Miniatures chapter, which is a really nice how-to section with painting tutorials on how to paint Mechs, Infantry, Vehicles and even little Battle Armor models. A lot of ground is covered in this section, and overall it's a really impressive little section on the hobby aspect of BattleTech. I particularly found it useful that they took the time to include a section on Kitbashing, which detailed how to do conversions on the models, and they even took it a step further by outlining how to use rare-earth magnets too. I can't remember the last time I saw a painting guide included for free in a rulebook that was this helpful overall. Pages 300-302 make up the Index, which is very helpful in a book this large. Finally pages 303-312 includes all of the quick reference sheets needed to play the game with. However many of these are specific to unit types. For instance 311-312 is specifically for Aerospace units, page 310 covers Buildings & Infantry, page 309 is for ProtoMechs & Vehicles, pages 307-308 covers Combat, page 306 covers Ground Movement and pages 303-305 are the weapons tables for all of the units in the game. As a rulebook I think Total Warfare does a really good job of bringing together into a single book all of those previous rulesets that used to come separately in the earlier FASA days of BattleTech. It's a two edged sword really, because by covering so much ground in a single book, that does make it a little harder to decipher what info you need to get started if you wanted to play just Mech on Mech combat. Yes many of the sections are defined clearly separating the rules for Infantry, Vehicles, ProtoMechs and Aerospace into their own sections, but at first glance determining what's needed to play Mech on Mech combat alone just isn't very clear. In all fairness I had to repeat that from the back of the book, because I'm in agreement with everything they said in that statement. However that doesn't mean you can't learn the game from Total Warfare either as a complete noob player. In 25 years I never attempted to play BattleTech until now, and I was able to figure it all out from Total Warfare, with a wee bit of guidance through asking the Catalyst guys some simple questions as I forged ahead. Most of what I asked I knew the answers to already, I just needed confirmation that I had things right too. 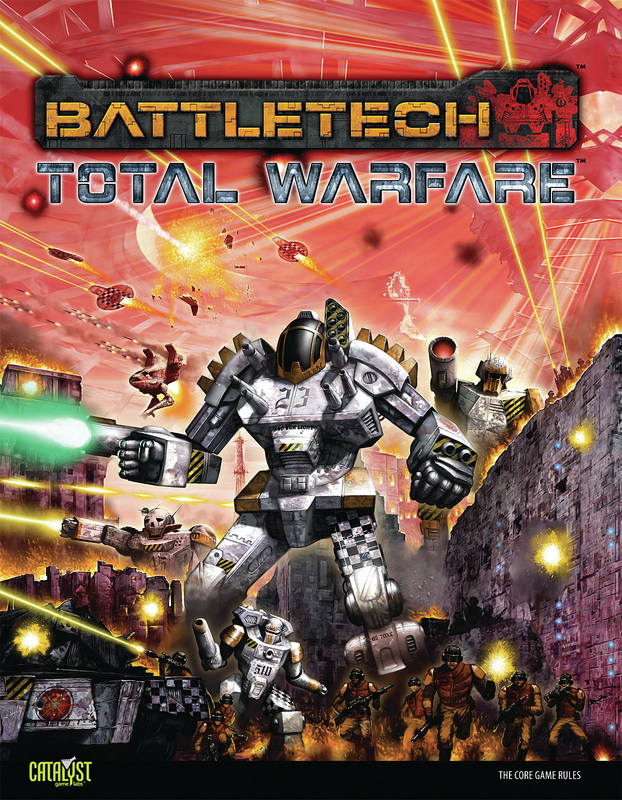 So technically the Total Warfare Core Rulebook, combined with my knowledge of the BattleTech universe (from years of BattleTech/Mechwarrior PC/Console gaming, and familiarity with Wizkids' incarnation of Mechwarrior) is all I needed to learn the game. In their defense as well, I have to mention that the Introductory Boxed Set is the product designed to ease players into BattleTech, so they do offer a less confusing option for new players, it's just out of print at the moment, and the new one is still in the works. I just had to learn BattleTech the harder, but more rewarding way by starting with Total Warfare first. The Total Warfare hardcover is $39.99 USD, and the full color .PDF version can be had for just $15 USD. As I stated earlier, this is a true book in hardcover form, and it's full color throughout on premium quality glossy paper. I also forgot to mention that there's loads of really impressive BattleTech art to be found throughout the book, and tons of photos to boot. Actually I'd go as far as saying that Total Warfare is easily as nice, or nicer than the books I've recently seen from Dream Pod 9 for Heavy Gear, and those are some of the best rulebooks I've seen to date visually speaking. I'd say the Catalyst Game Labs books are some of the very best that money can buy. Now this is my review of the Total Warfare Core Rulebook for BattleTech, NOT my review of the game of BattleTech. I'm doing things a little differently this time out, as I normally review the rulebook and the game within the same article, but to do so for BattleTech has required a lot more words than I felt comfortable forcing someone to read all at once. Having said that stay tuned for my in-depth review of the game of BattleTech, and the models from Iron Wind Metals for BattleTech as well, both of which are being posted as separate articles very soon.